The first weekend of December is traditionally when people dig out their Christmas DVDs and treat themselves to some feelgood schmaltz. Watching movies like Miracle on 34th Street, It’s A Wonderful Life and Elf feels as warming and comforting as slipping on your favourite pair of (festive) slippers. But…well, don’t you get a bit bored of watching the same few films every Christmas? Try something different this year and watch these underrated Christmas classics. Arthur Christmas is often missed off ‘best Christmas movie’ lists, but that’s probably because it hasn’t been out long enough to claim its rightful place as a Christmas classic. This animation, written by Sarah Smith and Peter Baynham (who co-wrote, amongst other things, I’m Alan Partridge) follows the son of Santa Claus (that’s Arthur, who is voiced by James McAvoy) as he tries to deliver a present to a girl Santa has accidentally missed on his annual delivery rounds. Like Elf, Arthur Christmas is one of those lovely Christmas movies that adults and children can enjoy, with a brilliant cast of characters and some wonderful animation too. There are countless modernisations of A Christmas Carol, but Scrooged has a distinct advantage over the rest: Bill Murray. Murray plays Frank, a television executive and modern-day version of Scrooge who makes bizarre and slightly terrifying Christmas commercials. You’ll know the rest if you’ve ever seen or read A Christmas Carol (is there anyone who hasn’t? ), but that doesn’t stop Scrooged from being a breath of fresh air for those sick of sweeter-than-sweet Christmas movies. Did we mention Bill Murray is in it too? Even if the prospect of watching Muppet mice tussling with bears, owls and Iron Man over a tree doesn’t appeal, superhero fans are bound to enjoy seeing Tony Stark singing about his love of Christmas trees (we’d love to see a reprise in the next Avengers film…). Jingle All The Way is a movie a lot of people love to hate. It promotes rampant consumerism and teaches kids that toys are the most important part of Christmas, they say. That’s fair enough: the movie is practically all about one man trying to make up for years of neglect by buying his son a Turboman doll. In fact, we’d probably hate it too if it wasn’t for Arnold Schwarzenegger, whose slightly-crazed performance perfectly captures the horrors of Christmas shopping. A young boy receives a cute little critter called a Mogwai for Christmas. His only instructions are not to feed him after midnight or get him wet; you can probably guess what happens next. This black comedy (which definitely isn’t suitable for kids) stars Billy Bob Thornton as an alcoholic thief who disguises himself as a Mall Santa so he can rob shops, and follows him as he befriends a young boy who thinks Billy Bob’s drunk Santa is the real deal. 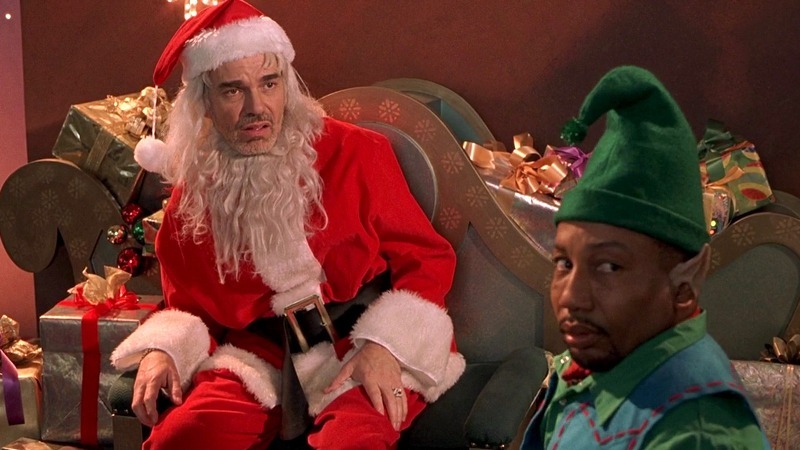 Although it’s pretty much the opposite of a heart-warming Christmas film, Bad Santa is quite touching in its own right as young Thurman teaches pretty much the worst Santa to ever exist the error of his ways. Mainly, though, it’s very, very funny. Nothing says Christmas quite like…erm, a film about someone dressing up as Santa Claus and killing people with an axe. It’s fair to say that Silent Night, Deadly Night – which is basically about a bloke who kills teenagers for being ‘naughty’ – isn’t your standard Christmas fare, but it’s a pretty good horror film reminds us all that the idea of a chubby red fellow breaking into our homes while we sleep is actually quite terrifying. Fun fact: Silent Night, Deadly Night sparked moral outrage on release, with large crowds of protestors picketing the film throughout the US. That led to all adverts for the film being withdrawn less than a week after the film’s release, and the film itself being withdrawn soon after. Which alternative Christmas films do you enjoy? Let us know in the comments! And if you’ve got any Christmas DVDs (or any DVDs, for that matter) that you don’t watch anymore, see how much you could get for them with musicMagpie!